We don’t know how well cities will cope in extreme heat. 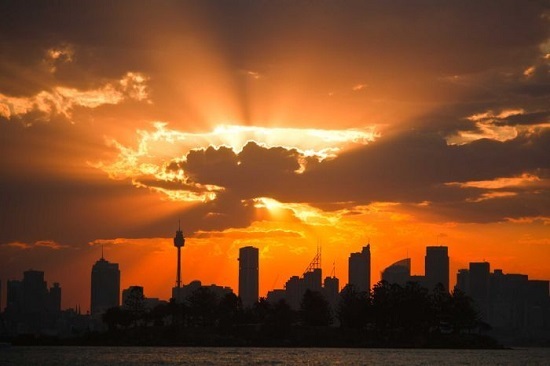 Sydney and Melbourne both have records hovering around 46 degrees. 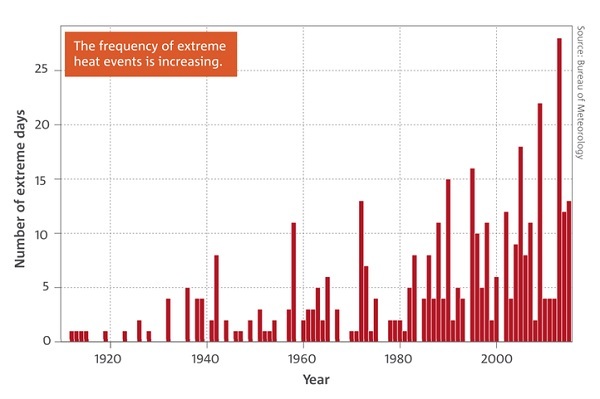 During last year’s warm winter over 260 heat and low rainfall records were broken. A study led by Dr Sophie Lewis projected daily temperatures of up to 3.8 degrees Celsius above existing records in Victoria and New South Wales. “One of the hottest years on record globally in 2015 could be an average year by 2025,” she said. Infrastructure can be affected. Marco Amati from RMIT University remembers toward the end of the Millennium drought seeing railway workers in Melbourne spraying railway tracks to try to keep them cool because they were bending out of shape. Fossil electricity is apt to fail. In February 2017 some 14% of gas and coal generation failed during the heatwave when we needed them most. On 28 September this year Giles Parkinson wrote that so far this year, the big coal and gas generators have tripped more than 100 times. However, extremes can kill as there is a threshold, with some individual variation, at which heat becomes deadly. The Mira Adler-Gillies article tells how the lining of the gut breaks causing blood poisoning, so that immune system cells attack these particles inside your body, creating coagulations that eventually clog the kidneys and parts of the lungs. Associate Professor Camilo Mora from the University of Hawai says that by the end of the century over half the world’s population will be exposed to this kind of deadly heat for at least 20 days a year. Melbourne’s 2014 heatwave triggered a surge in demand for ambulances that greatly exceeded the number available. Many of those in distress waited hours for help, and the death toll was estimated at 203. This century they have surged dramatically and most working in the area think they are going to continue to surge from here. 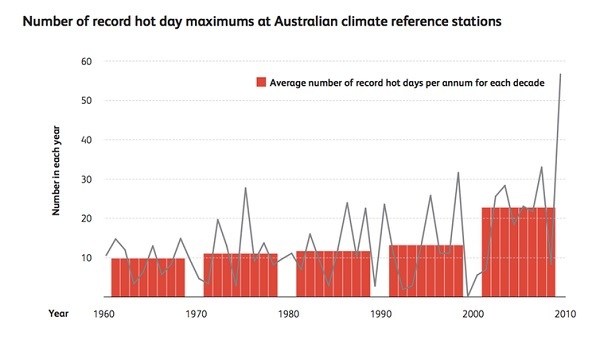 Andrew Gissing and Lucinda Coates ask Australia’s ‘deadliest natural hazard’: what’s your heatwave plan? 45% of those at risk – including the elderly, ill and very young – did not proactively respond to heatwave warnings as they did not think it necessary or did not know what to do. Few at-risk people reported moving to cooler locations, and more than 20% of people in Western Sydney were concerned about the impacts of energy prices on their ability to use air-conditioning. Nicholas Rajkovich looks at the multiple solutions that should be pursued by American cities to mitigate heatwaves. If a diamond is on the right-hand side of the chart, it means the net number of deaths is expected to be lower under 1.5 than 2C. 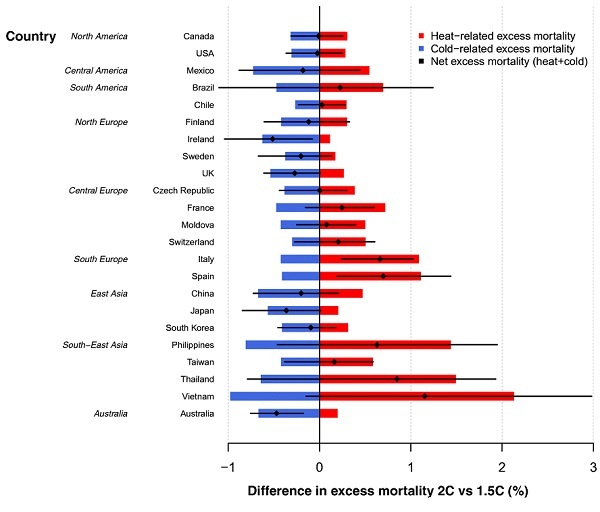 However, if it is on the left-hand side, it shows that the net number of deaths is expected to be higher under 1.5 than 2C for that country. The only acceptable goal, however, is to return the climate to the condition in which human beings thrived during the last 9,000 years. 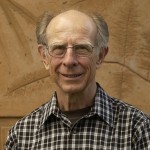 David Spratt has laid a landmine in front of the IPCC’s report due out this month which is charged with telling us how warming can be limited to 1.5°C. A number of scientists, including Prof Michael Mann and Prof Stefan Rahmstorf of Germany’s Potsdam University consider that we are now “in a kind of climate emergency” and that at least 1.5°C is “locked in” and could be reached in about a decade’s time. This brings us into the zone where tipping points may move us further, virtually no matter what we do. Clearly climate as we now experience it has become significantly problematic, but we are only experiencing the short-term effects of emission levels already there in the atmosphere. Meanwhile as a personal anecdote, I remember coming down in a hotel lift in Wellington in January 1981, when my co-passenger said, “Looks like another stinker today!”. The forecast was for a maximum of 22°C. Craig Kelly, a prominent Liberal Party backbencher, has told party members in Sydney they should not worry about climate change and that fossil fuels were among the reasons “we are so safe”. Addressing a gathering of members last week at the Middle Harbour Yacht Club, Mr Kelly said “we’ve always had dangerous weather” and that “even the climate has changed in space”. And because humanity is so dependent on finite and rapidly depleting fossil fuels for our energy needs, then we will be in dire circumstances when fossil fuel supplies, particularly petroleum oil and fossil natural gas, begin sustained declines probably before 2030, with a significant risk before 2020. Kelly and his ilk appear to live in an alternative reality. Uff yew carnt take the Wullington heat, jest stay out of their hotel lufts!! Our NZ cousins have a lot to answer for. It seems as if the federal government is using a well-worn tactic: If a government report finding is inconvenient, sit on it until some other big distraction comes along before releasing it, hoping no one will notice. 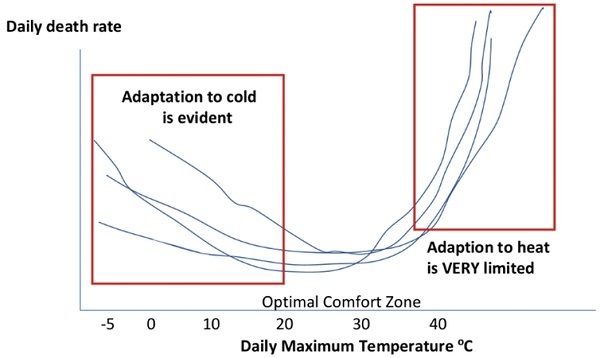 When outside in the environment, you can always put on more clothes and protective apparel in colder conditions, but there is only so much clothing you can remove in hotter conditions. 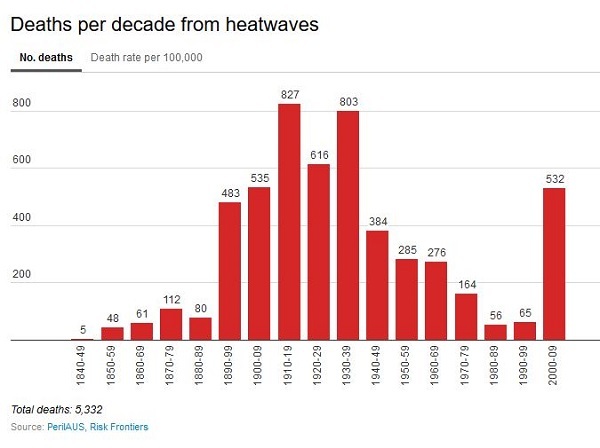 And yet Craig Kelly says we need not worry about climate change: “we are so safe”. Geoff M, thanks for the climate data release link. I heard the ACF comment on the radio today. At last, some rain for inland NSW. A long piece in the New York Times about a Mr Murnane of Goroke in the Wimmera, who might be the “next winner of the Nobel Prize in Literature whom you had never heard of”. SMH‘s Environment Editor, Peter Hannam, posted yesterday afternoon, has an op-ed headlined Australians the frog in the saucepan as world warms up. Australian and South Korean officials have discussed drumming up investment in the controversial Adani mega-mine, according to official documents that appear to throw into doubt claims by the Department of Foreign Affairs and Trade that it has not helped secure finance for the project. Posted two days ago at The Guardian is the first of a new series on The new normal? How climate change is making droughts worse, by Nick Evershed, Andy Ball, Gabrielle Chan, and Mike Bowers. The “forthcoming analysis” is the IPCC report Summary for Policymakers due to be released on Monday (Oct 8). Posted on Wednesday (Oct 3) at The Guardian is an op-ed by Bill McKibben headlined The Trump administration knows the planet is going to boil. It doesn’t care. Geoff M, thanks for punching out updates. I haven’t done a Climate clippings for three months now. Right now I’m finishing a look at the new National Emissions Inventory update, proving more complex than I expected. If I don’t finish breakfast I may well expire, so hope to finish by about lunch time. Finally at last – National emissions inventory scam(s). John, the stats on that one look a bit low. I think it is CO2 rather than GHG. It’s hard top find up to date stats. NZ has one for GHG from 2014. EDGAR, who I would rate has an alphabetical one for 2012 and one from 2017 with a lot of stuff. Bottom line is that as a major economy (G20) we are pretty much at the top, so should get serious. As an example we are near the worst. Former prime minister Malcolm Turnbull has blamed the rush to grant almost half a billion dollars to the Great Barrier Reef Foundation in one hit on his successor, Scott Morrison and Finance Minister Mathias Cormann. Click on the link to the Australian Senate inquiry into the Great Barrier Reef 2050 Partnership Program (you may then need to click on the “Answers to Questions on Notice” link). Turnbull’s letter is #15 on the webpage. Geoff M, the idea that it had to be expensed in 2017/18 figures with the comment of Geoff Cousins at the time. He said the govt wanted to be able to say to UNESCO that they had saved the GBR, so that its heritage status could be sustained. I couldn’t find a link, but came up with this North Coast Voices story derived from The Guardian, which emphasises that they wanted the govt to look good – an exercise in greenwashing.